Filling your days in Rome is a beyond easy task: the list of bucket-list-worthy experiences in Rome is a mile long, and it’s truly impossible to be bored in the city. Trying to decide what to do in Rome at night, though, is a bit trickier. Deciding where to go, what to do, and even figuring out what options are available often requires a bit of research–but don’t worry. From laid-back neighborhood explorations to delightful dinners to iconic tourism experiences (did you know you can tour the Colosseum at night? 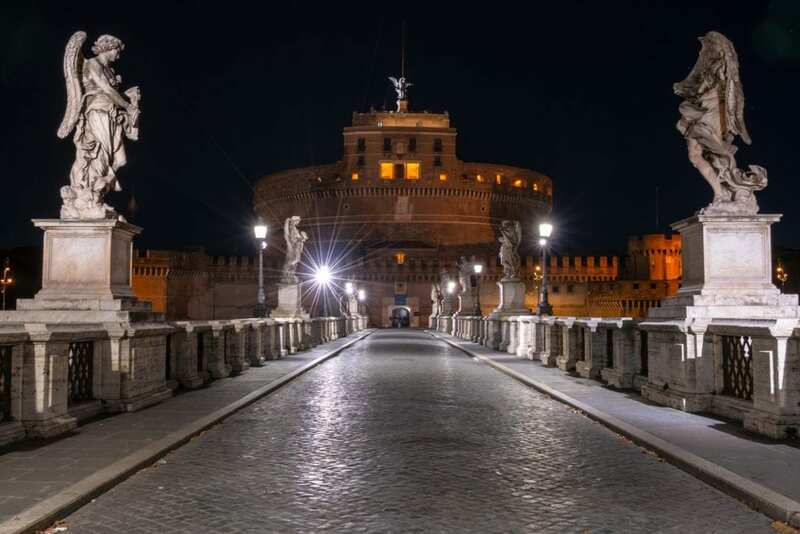 ), there are some truly incredible things to do in Rome at night. Throw a coin in the Trevi Fountain. Rome’s Trevi Fountain is rightfully famous, but during the day, it is often so packed with crowds that it can be hard to enjoy. Tossing the traditional coin in the Trevi Fountain to ensure you come back to Rome often involves a long dance of nudging your way to the front of the crowd–hardly the experience most of us dream about having at the Trevi Fountain. 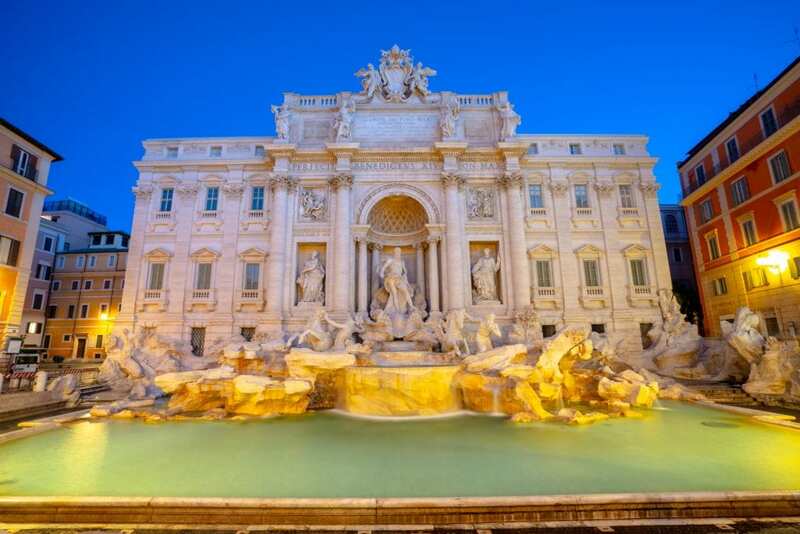 In the dead of night, though, you’ll find the Trevi Fountain deserted! Experiencing such a beautiful masterpiece alone is a truly special experience. Sure, your photos might look a little different than those who stop by during the day, but the memory is sure to be one worth cherishing. Want to experience the Colosseum in a way that few visitors ever do? 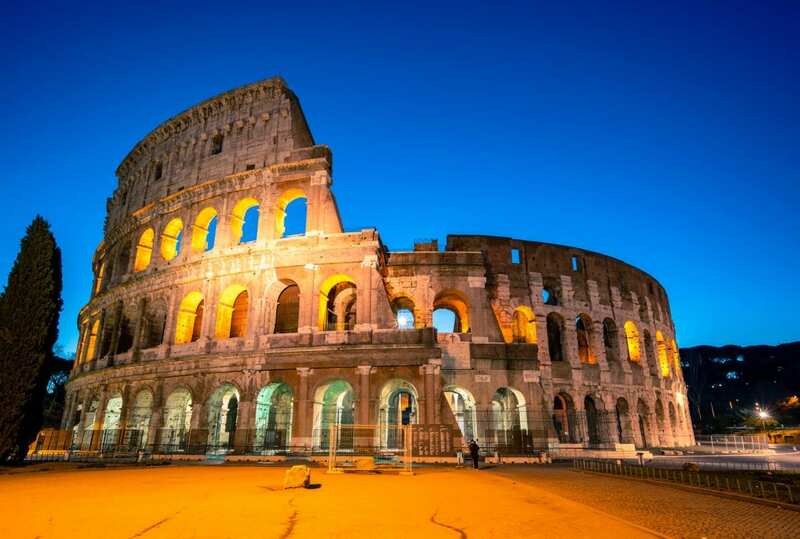 Tour the Colosseum at night! After the gates close to most visitors, you can still purchase a specialized tour to see the Colosseum under the night sky: no crowds. No heat. Just you and the weight of history. 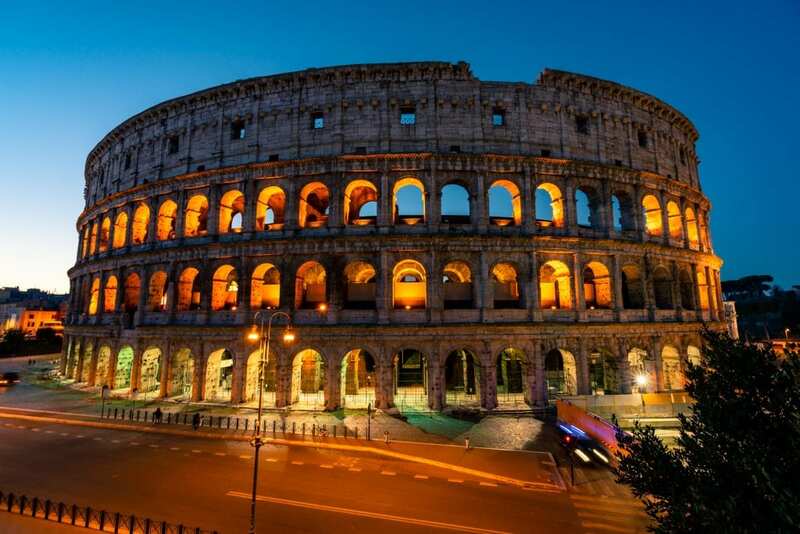 Book your visit to the Colosseum at night today! Enjoy the nightlife in Trastevere. 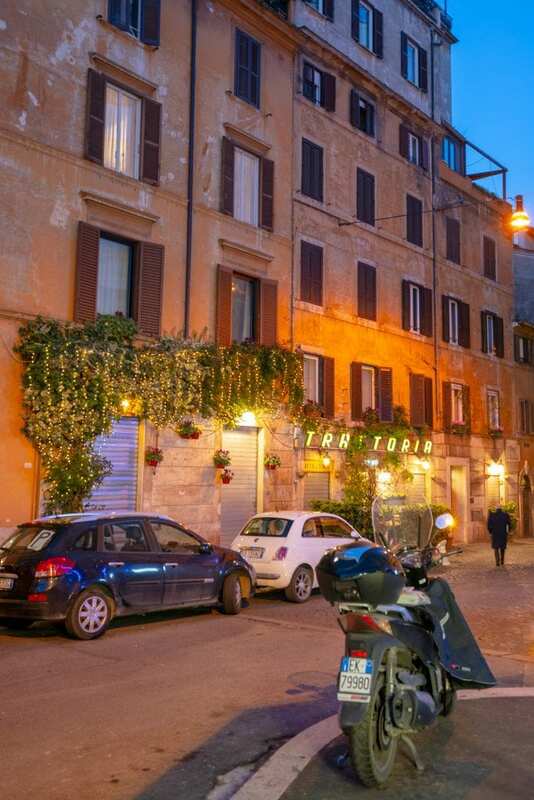 If you’re looking for a place to enjoy the nightlife in Rome that is both beautiful and reasonably accessible to tourists, Trastevere is the perfect spot: this neighborhood comes alive at night, with bars and restaurants on nearly every corner. If you’re looking for an even more local feel, you might also want to look into the neighborhoods of Testaccio and Pigneto when deciding what to do in Rome at night. Explore Vatican City after the crowds have gone home. Like the Colosseum, with a little advance planning, it is possible to add touring the Vatican Museums to your list of what to do in Rome at night! If you’re hoping to experience the magic of the Sistine Chapel without literally standing shoulder-to-shoulder with hundreds of your new closest friends, plan a Friday evening excursion to the Vatican! The museums are only open at night on Fridays, so they’re far from deserted–but the crowds are much thinner than during the day. 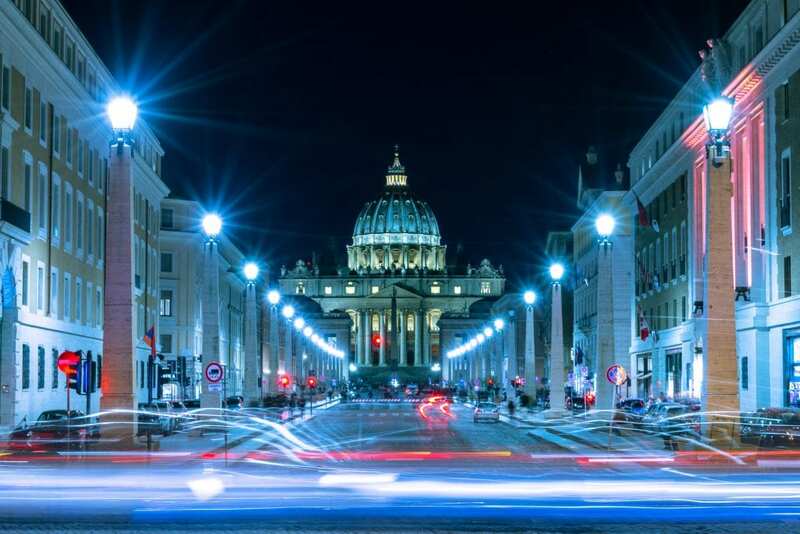 Get your tickets to experience the Vatican Museums & Sistine Chapel at night! Check out a rooftop bar. What better way to enjoy a glass of prosecco in Rome than by sipping it at a beautiful rooftop bar? Rooftop bars in Rome, especially on warm summer nights with a sunset, are the perfect way to start an evening in Rome. A few popular choices include the rooftop bars at Hotel Minerva and at Hotel Raphael, but there are incredible rooftop bars all over Rome! Substitute a delicious food tour for a traditional dinner. Don’t want to sit down for a traditional dinner? Add a food tour to your list of what to do in Rome at night! 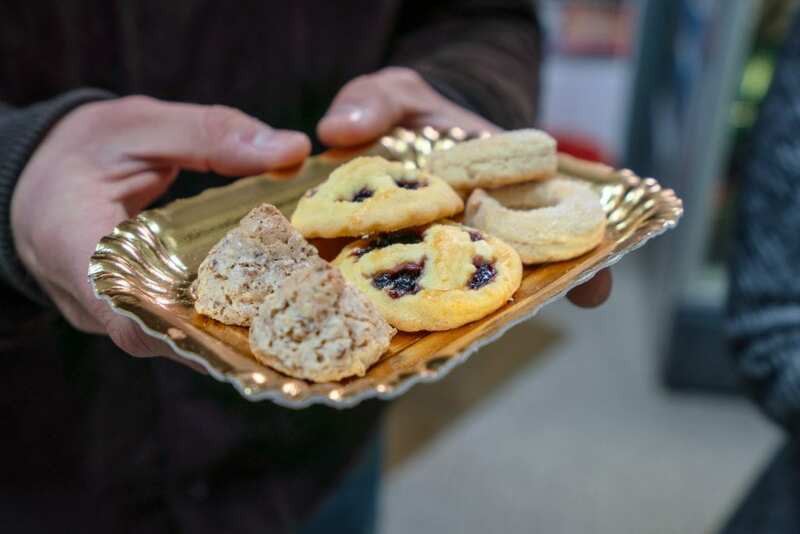 Food tours are one of our favorite ways to explore a city, and Rome is certainly no exception. On a food tour, you can taste many new dishes fast (without committing to an entire portion), find great restaurants, learn the names of and how to order all your new favorite foods, and with a good guide, learn about the neighborhood you’re exploring as well. We loved this food tour through Trastevere, which has an evening option. If you’d rather hop across the Tiber and explore a different neighborhood, this food tour through the Jewish ghetto and Campo de’ Fiori gets great reviews as well. 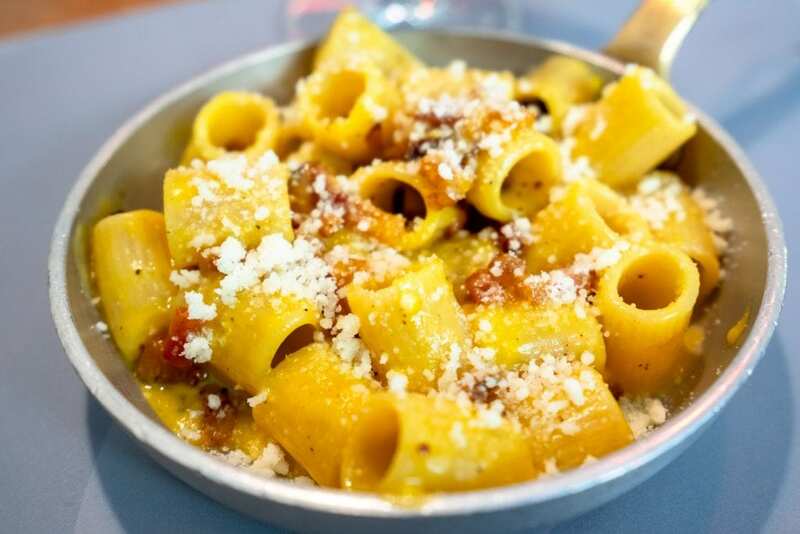 Book the same Trastevere food tour that we loved today! See a show at the stunning Teatro dell’Opera. Want to get all dressed up and enjoy a unique night out in Rome? Head to the opera! Sure, you won’t understand much of what’s going on if you don’t speak Italian, but by attending an opera in Rome you will get the chance to participate in an exciting cultural experience, see a side of Rome that few tourists do, and admire the interior of the stunning Teatro dell’Opera while experiencing beautiful music. 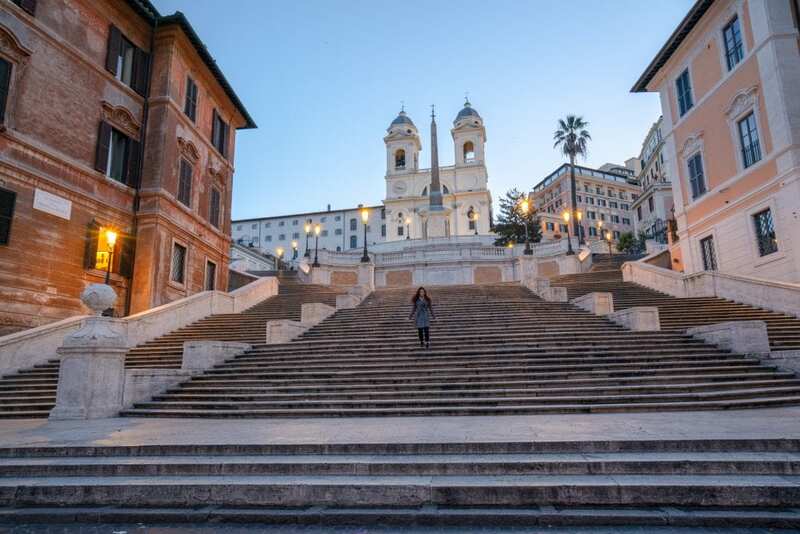 Sit on the Spanish Steps… possibly alone! Similar to the experience you might have during the day at the Trevi Fountain, the crowds on the Spanish Steps during the day are notoriously large–during the summer, it can be difficult to even see the steps at all underneath the sea of tourists that stack themselves on the steps like they’re attending a sports event. There’s no shame in that–we’ve definitely been part of that crowd more than once–but if you imagine yourself lounging on the steps without a soul in sight, add the Spanish Steps to your list of what to do in Rome at night. In the mood for a spooky experience? Tour Rome’s catacombs at night. Rome’s many catacombs are fascinating at any time of day, but at night, without crowds and under the cover of darkness, the atmosphere becomes just a bit spookier. This tour will take you not only to the catacombs of Santa Priscilla at night but also to the bizarre and fascinating ossuary that is the Capuchin Crypt, which is, hands down, one of the most bizarre and unforgettable sights we have ever seen. If bones and ghosts don’t scare you off, definitely add this to your list of what to do in Rome at night! Book your nighttime catacomb tour now! 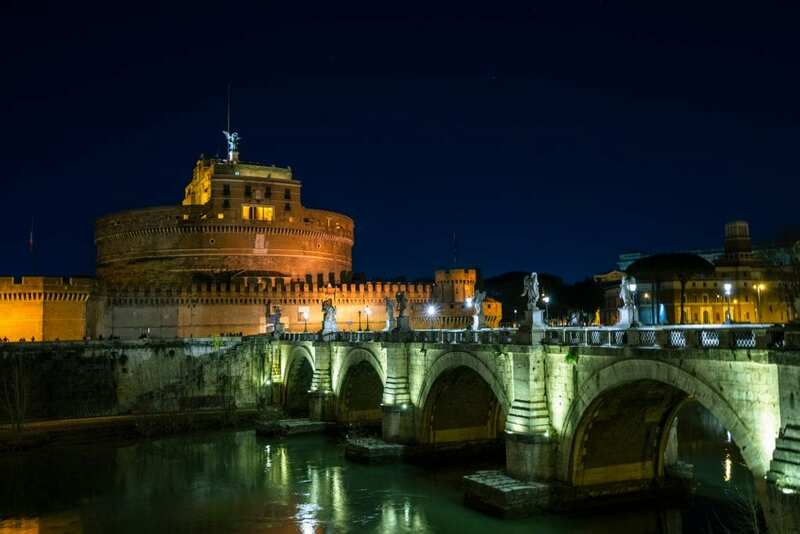 Learn about Rome’s darker legends on a ghost tour. Catacombs and crypts not enough spookiness in Rome for you? Take in some of Rome’s darkest legends on a dark heart of Rome tour! 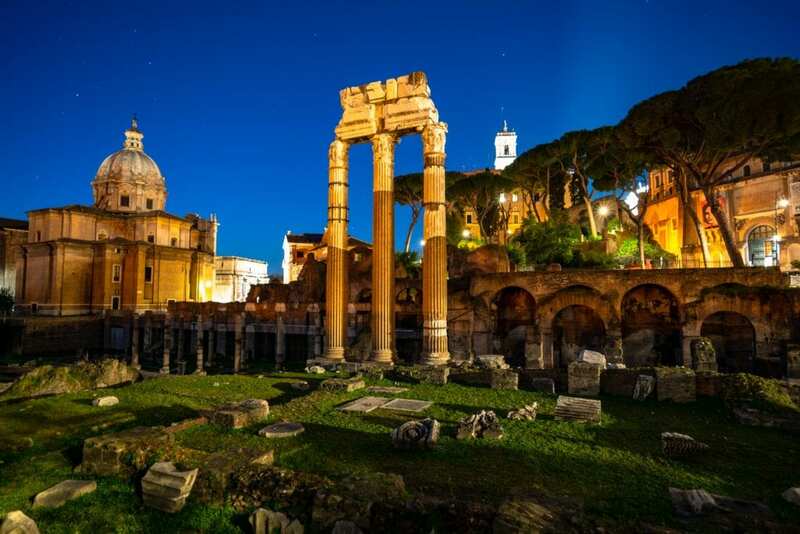 Not only will this give you a chance to explore parts of the city at night that you may have overlooked during the day, you’ll get to experience a completely different take on Rome’s history than you would get at a standard daytime walking tour. Explore Rome’s spooky and supernatural elements with this affordable walking tour! Enjoy dinner like a Roman. Dinners in Rome are long and slow, ideally starting around 9:00pm and lasting for at least a couple hours. Pick a great restaurant (you may want to make reservations a couple of days ahead of time if you have a popular spot in mind), take leisurely breaks between courses, enjoy plenty of conversation and wine, and eventually waddle your way out of the restaurant more stuffed than you’ve ever been. 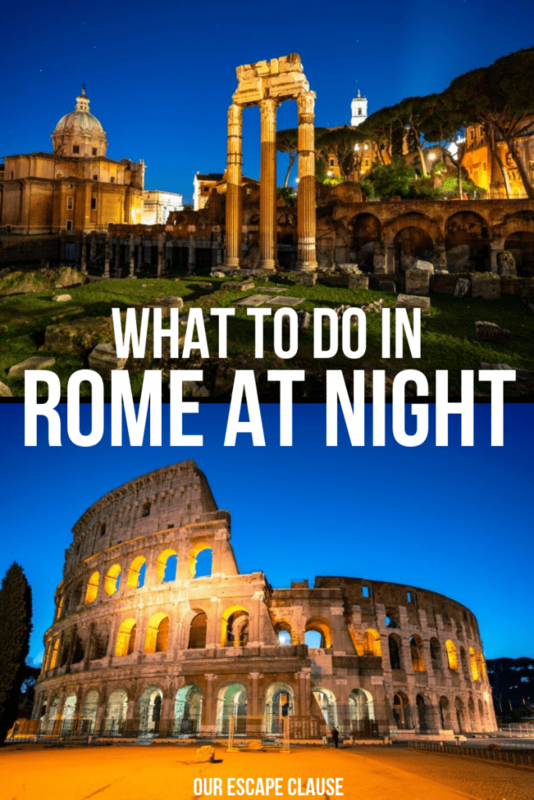 True, this isn’t something you’ll want to do every day–but at least once during your trip, it’s an experience worth having in Rome at night. Take part in the tradition of apertivo. Why are Romans able to wait to eat dinner at 9:00pm when our stomachs are growling much earlier (leading to the occasional Rome travel mistake of a visitor attempting to visit a closed restaurant)? Because of apertivo! Essentially, apertivo is a set time–generally between 7:00pm and 9:00pm–where you can buy a drink at a bar that also comes with a snack. The snack can range wildly, from a bit of bruschetta all the way up to access to a buffet serving things like meats and cheeses, and it’ll definitely help you stay full until dinnertime. Take a nighttime stroll through Centro Storico. One of our absolute favorite times to wander through Centro Storico is at night when the tourists are all at dinner or home, the streets are empty, and the city feels like magic. This is Rome’s most central neighborhood, and it is generally quite safe. It’s also where you can find many of Rome’s highlights, including Piazza Navona, the Pantheon, the Trevi Fountain, and the Spanish Steps–and all of these locations are even more stunning when you have them to yourself. Attend a movie at an open-air cinema. If you’re looking for something to do in Rome at night that is focused less on tourism and more on enjoying the city like a local, go see a movie! On summer nights, many spots in Rome transform into open-air cinemas–and occasionally you can even find films being shown in English, as some of the cinemas show movies in their original language with Italian subtitles. Pay attention to the metro hours! Rome’s metro service ends fairly early for a major city, at 11:30pm on weekdays and 1:30am on weekends. If you’re planning a late night, consider taking alternate transportation home! You can check updated metro hours and prices here. Rome is generally a safe city, but take usual precautions. 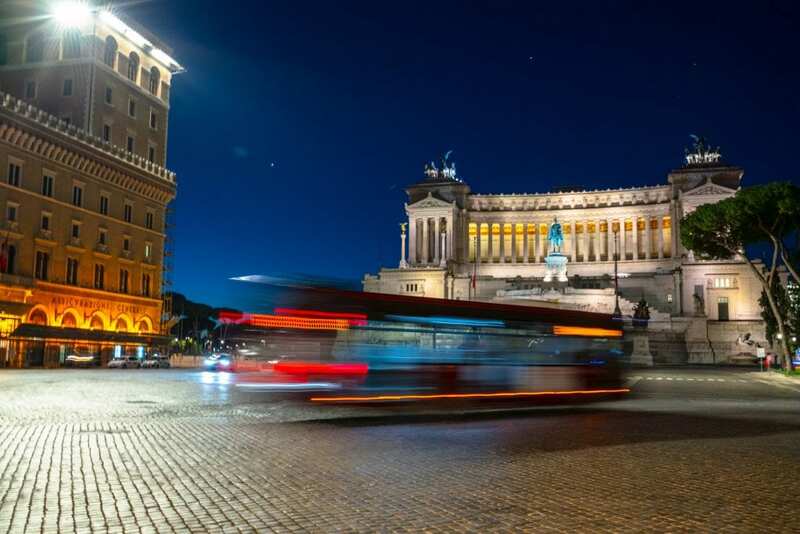 Though Rome is generally quite safe and we regularly go out at night with no concerns, you’ll still want to take all the normal safety precautions that you would in any major city: be aware of your surroundings, stick to populated, well-lit areas, don’t get overly intoxicated, and ensure you have a safe route home. Don’t expect to eat dinner at 6:00pm. The best restaurants tend to open for dinner between 7:30pm and 8:00pm. You’ll find a handful open at 7:00pm, but 6:00pm? Everyone is still at apertivo! Don’t be afraid to make reservations. Rome’s best restaurants fill up fast, and reservations are common. Add that to late opening hours and leisurely dining times, and if you head to a popular restaurant without a plan, you’re more likely to hear, “sorry, we’re full, try again tomorrow” than “it’s an hour wait”. If you have a particular restaurant in mind that you want to experience in Rome, don’t be afraid to make reservations! Many popular spots allow you to make reservations online. Alternatively, you can call to make a reservation (or have your hotel call for you).